Rose to recognition for her portrayal of Ash in the Netflix series Team Toon. 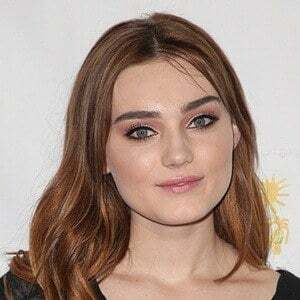 She went on to star as Taylor Otto in the ABC comedy series American Housewife and appeared as Lilly Kelly in the feature film The Broken Ones. She also starred as Addison in Disney's Zombies. She began training in singing, dancing, and acting at Annie's Playhouse School of Performing Arts in 2005. Equally talented as a singer as an actor, she was the understudy for Louisa in the NBC live special The Sound of Music. She was born in New York City and raised in Peapack, New Jersey, and is an only child. She played the role of Annie in the Nickelodeon pilot Future Shock alongside Sedona James.